All too soon we are here once again to commend one of our sisters to God. 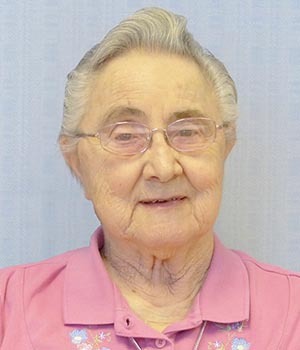 Sister Jane Frances, baptized Rose Mary, was born on February 2, 1930, in Lancaster, Pennsylvania, to William H. and Amelia Reus. 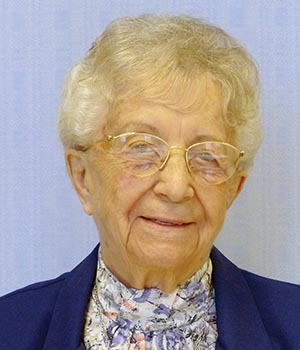 Her mother was a homemaker and her father held various jobs during the depression at Sacred Heart Academy and St. Anthony’s grade school in Lancaster. She had two older siblings: Charles, who was a tail gunner in World War II and after the war became a pharmacist; and Marcia, who worked in retail sales. Like many of us, Jane was greatly influenced by the sisters who taught her. 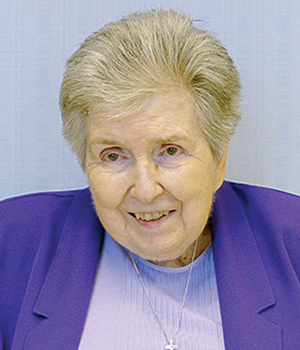 Sister Rita Elaine, her eighth-grade teacher, and Sister Mary Elizabeth Boyle were strong influences in her decision to become a Holy Cross sister. 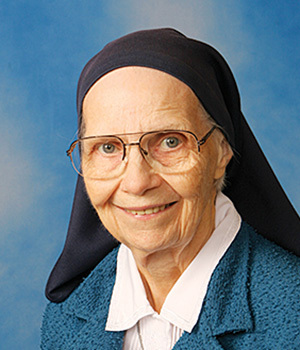 Rose Mary entered the Congregation on February 2, 1948, her birthday; she received the habit and the religious name, Sister Jane Frances. An interesting coincidence: She received the religious name after a former Sister Jane Frances who had been in Lancaster for many years. The older Sister Jane Frances died in December of 1948, and Rose Mary received her name in February 1949. Coincidently, the older Sister Jane Frances had taught Rose Mary’s mother. Her love for music was evident at an early age when she became the pianist in grade school and later the organist at St. Anthony’s parish church from 7th grade until she left for the convent. Her love of music continued throughout her religious life. Jane Frances’ distinctions were many. She was a teacher and principal, a pianist and organist, and, perhaps least known, an accomplished poet. She once remarked to a friend, “The easiest way for me to find God is in nature.” In her own poetry, Jane focused on her spiritual growth, grateful for God’s work that was readily available to her. I’d like to read one of her poems, which I think captures Sister Jane’s attitude toward life as we saw her live it: She loved nature! And its fragrance and beauty reached out to me. I found on the grass a butterfly wing. And its colors bespoke a beautiful thing. Tell of God’s love in all we meet. Is a gift of His love. Make me appreciate God’s wonder Being. I will fulfill His command of WHY He made me. Jane earned her bachelor’s degree in music from Dunbarton College, Washington, D.C., and her master’s degree in music education as well as a master’s in liturgical music from Catholic University of America, also in Washington, D.C. She also completed harmony courses at the New York College of Music. 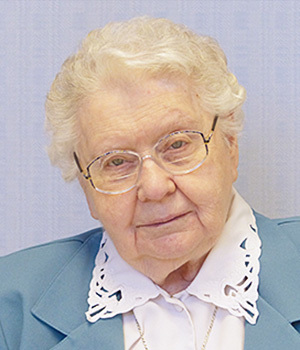 The major highlight of her active ministry years, she said, was really anything involving music, including the classes and organ lessons at Catholic University, which helped prepare her for her ministries. To see how accomplished Jane was, one has only to note that as a substitute organist, she was permitted to play in the crypt church of the Basilica of the Immaculate Conception in Washington, D.C. The range of Jane’s impact literally stretches from the East Coast to the Midwest. 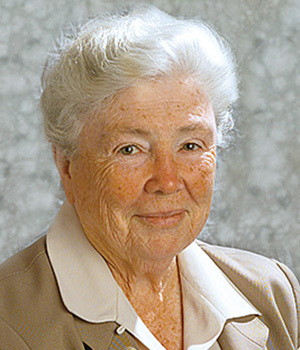 Her teaching assignments extended from Washington, D.C., Maryland, Virginia, Pennsylvania and North Carolina and to the campus school here at Saint Mary’s, to Ohio, Texas and ultimately St. Paul’s in New York City. Somehow, in all of her assignments, she never quite made it beyond the Midwest to the Western states. But her days were not filled completely with work. Simplicity was the hallmark of her life. She enjoyed life simply. Although her main gift was music, like most artists her talent extended beyond music to needlework, sewing and poetry. Like several other Sisters of the Holy Cross who were poets such as Sisters Madeleva Wolff, Dorothy Anne Cahill and Campion, Jane amassed quite a volume of poetry. Before she became so ill, Becky (Drury) and I were working with her to have her poetry published. We intend to continue this effort in tribute to her great talent. In August of 2006, Jane came to Saint Mary’s where she received the medical treatment needed to address her serious illness. She remained here initially for two years before returning to be the organist at Saint Angela Hall in Kensington, Maryland. 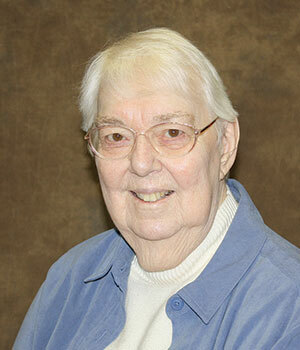 In 2013, she retired once again and rejoined our community here at Saint Mary’s. 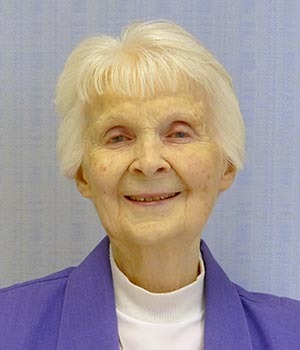 Sister Jane Frances, like many artists, was soft-spoken, introspective and deeply centered. She saw God’s beauty and wonderment in all things and all people. 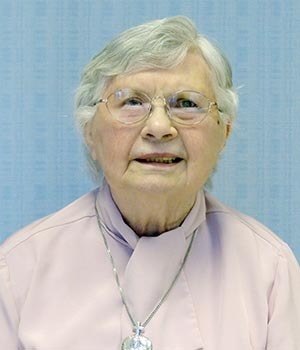 She was dearly loved by her students, those she visited in her parishes, her student friends at Saint Mary’s College as well as her sisters in Holy Cross. My fondest wishes go out to thee. Joys and sorrows, struggles and ease. Reach out, hands open, to what will be. Dear friend in Christ, remember me. I’m certain we will remember Jane as she enters the kingdom!